The Promotion commences 0800HRS, 1st Aug, 2018 and closes on 2000HRS, 31th Aug 2018 (“Promotional Period”). *Promotional Period may be extended at the Organizer’s sole discretion. *Reminder: Must keep the original receipt as prove . There is no limit on the number of entries per Participant provided that each entry is original. Each entry becomes the property of the organizer upon receipt. (h) not breach any relevant laws. The prize winner(s) will be selected on 1000HRS 7th Sep 2018. The winner(s) will be notified via phone before 14th Sep 2018. Prizes not claimed by 21th Sep 2018 may be withdrawn at the organizer’s discretion. The organizer and/or its agency may require the prize winner to provide proof of identity, proof of age and/or proof of residency as a condition for claim of prize. Identification considered suitable for verification is at the sole discretion of the organizer and/or its agency. The prize will be awarded only to the winner and not to proxies or representatives of the winner. Prize, or any unused portion of a prize, are not transferable or exchangeable and cannot be taken as cash, unless otherwise stated. The organizer, in its sole discretion, reserves the right to substitute the prize (or that part of the prize) with a prize of equal or greater value and/or specification, subject to written directions from any regulatory authority. (d) cancel the prize(s) or otherwise cease to provide any benefit of the prize(s) if the winner(s) or travel companion(s), if applicable is/are, in the opinion of the organizer, under the influence of alcohol or any other drug, behave(s) in an aggressive, offensive, uncontrollable, unruly or disorderly manner, engages or attempts to engage in illegal conduct, behave(s) in a manner which may tarnish or diminish the goodwill, name and/or reputation of the organizer, its brands and/or products concerned, its agencies and companies associated with this Promotion, or behave(s) in a manner which is otherwise inappropriate. The organizer’s rights (including but not limited to recovery of damages or other compensation) in relation to any misconduct of the Participants are expressly reserved to the fullest extent. The organizer and/or its agency may refuse to allow a winner to use or take part in any or all aspects of a prize if the organizer and/or its agency reasonably determines in its sole discretion that the winner is not in the mental or physical condition necessary to be able to safely do so. Taxes, if any, as well as any other costs and expenses associated with prize acceptance and/or use not specified in these terms and conditions as being provided by the organizer are the sole responsibility of the winner(s). If required by law, the organizer and/or its agency reserves the right to withhold and remit to the appropriate tax authorities the amount of any tax or taxes due on the prize. The winner(s) should seek independent financial advice about any tax implications that may arise from the prize winning. Except for any liability which cannot be excluded by law, directors, officers and employees of the organizer, its agencies and companies associated with this Promotion are not liable for any loss or damage whatsoever which is suffered, including but not limited to indirect or consequential loss, or for personal injury suffered or sustained in relation to participation in this Promotion or during the course of accepting and/or using any prize. The organizer’s decision on all matters is final and no correspondence will be entered into. The organizer reserves right to change, amend, add or delete any or all of the terms and conditions, and to offer alternative prizes, at any time and without any prior notice. If for any reason this Promotion is not capable of running as planned, the organizer reserves the right in its sole discretion, (subject to any written direction given by relevant regulatory authorities), to cancel, terminate, modify or suspend the Promotion or invalidate any affected entries. The organizer does not adopt or endorse, or accept any liability for, any statements or claims that are made by any person, or content that is posted on its website / Facebook page. Facebook is not a sponsor of the Promotion. This Promotion is in no way sponsored, endorsed or administered by, or associated with, Facebook. Participants understand and agree that they are providing their information to organizer and not to Facebook. The Promotion is conducted in Malaysia only and is governed by the laws of Malaysia. The organizer is Procter & Gamble (Malaysia) Sdn. Bhd., (P&G), 10th Floor, Surian Tower, 1 Jalan PJU 7/3,, Mutiara Damansara,, 47810 Petaling Jaya, Selangor, Malaysia, which (where the context permits such as in relation to assignments, licences, consents, authorisations, releases, waivers or indemnities by / from Participants), also includes each of the affiliates in the Procter & Gamble group throughout the world and their respective successors in title, assignees, licensees or authorised parties. TESCO advertising and promotions agencies. 1. This contest starts on the 19th of July and ends on the 15th of August 2018. 2. There will be a total of 100 winners nationwide. Each winner will win 1 prize only. There will be 25 winners per week. Each winner receives 4 pieces of first tier PinkFong Baby Shark Concert tickets worth RM 912 in total. 3. Each winner will receive notification on the date/time of collection of prize via WhatsApp. 1. 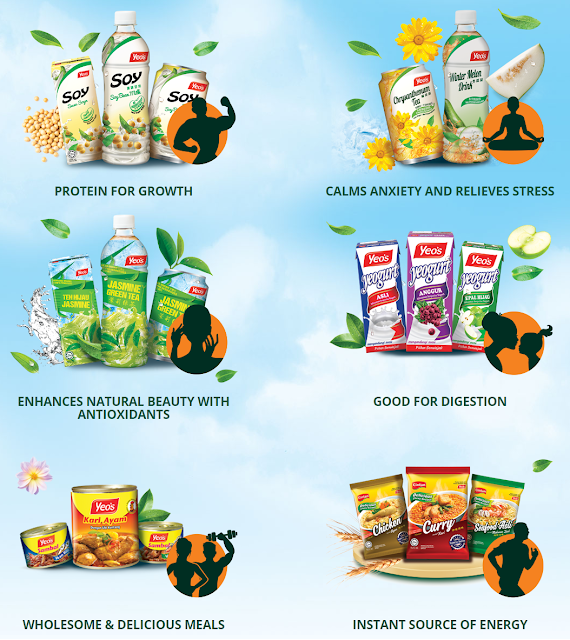 Participants can enter the BABY FAIR 2018 contest by spending a minimum of RM200 on any products in a single receipt in Tesco Stores to be eligible for 1 submission. 2. Participants must fill up their details of their full name at the front of the receipt. 3. Each receipt must be dated from the 19th of July and end on the 15th of August 2018. Participants must keep their original Tesco receipts as proof of purchase. 5. Photos submitted must be the current age photo of a child from infant age to 5 years old. 6. Photos must only be submitted by the parents or legal guardian of the child. a. 25 winners for 4 weeks at the end of the contest period (100 winners). b. The selected participant must answer a question and submit their Clubcard number in order to be eligible to be the winner of the week. c. The winning photos will be selected according to popular vote by the Tesco Selection Committee. d. All winners will be notified via WhatsApp text message. Winners will be notified to collect their prize on the day of the concert event at the concert venue. 2. Any unclaimed prizes on the specified date/time of collection will be forfeited. 4. Prizes are transferable, however not exchangeable for cash, benefits or substitution in any form whatsoever in lieu of the Prizes. 5. By entering the contest, the participants consent to the use of his/her name and photograph by TESCO for advertising and publicity purposes. 7. Tesco reserves the right to cancel, terminate or suspend the Contest without any prior notice. 8. Every winner has to have a valid Clubcard in order to claim the prize. 9. Winners that do not have a Clubcard can apply one during prize collection. 1. TESCO reserves the right to change the Terms and Conditions at any time without prior notice. 2. TESCO will not be responsible for any lost & any illegible/incomplete entries will be disqualified. 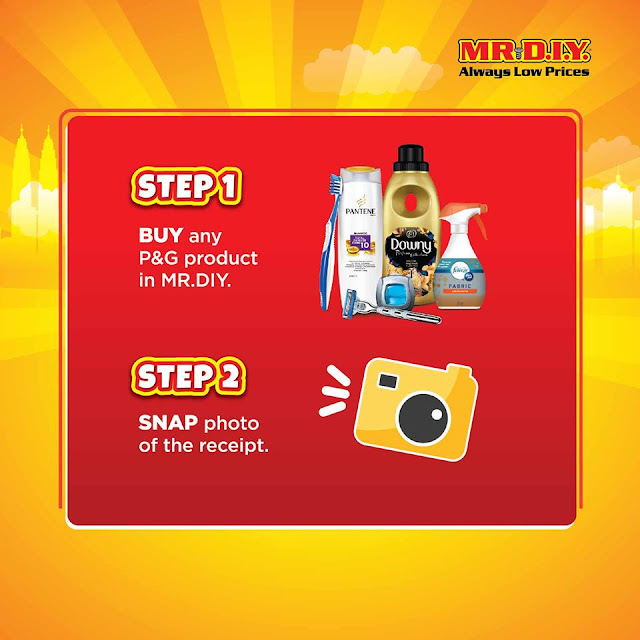 All entries become property of Tesco Stores (Malaysia) Sdn Bhd and will not be returned. False or deceptive entries or acts will be disqualified. 3. TESCO reserves the right to disqualify if found that there are any alterations or defacement on the required proof of purchase. 4. TESCO reserves the rights to replace the prizes with items of equal value without prior notice. 5. Prizes are transferable, however not exchangeable for cash, benefits or substitution in any form whatsoever in lieu of the Prizes. 6. By entering the contest, the participants consents to the use of his/her name and photograph by TESCO for advertising and publicity purposes. 8. Tesco reserves the right to cancel, terminate or suspend the Contest without any prior notice. For the avoidance of doubt, any cancellation, termination or suspension by Tesco of the Contest shall not entitle the participants to any claim or compensation against Tesco for any and all losses or damages. 9. Judges' decision is final and no correspondence or appeal will be entertained. 10. 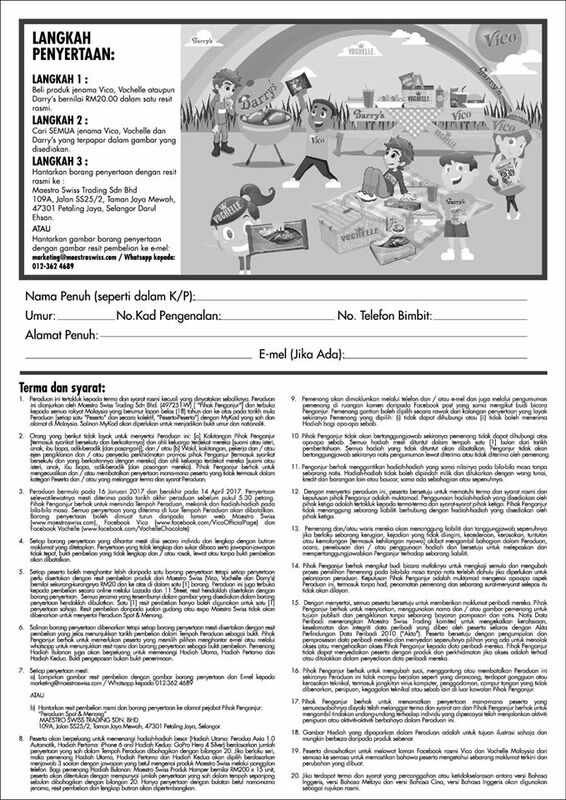 The rules and regulations herein are available in Bahasa Malaysia. In the event of any inconsistency, the English version shall prevail. 11. 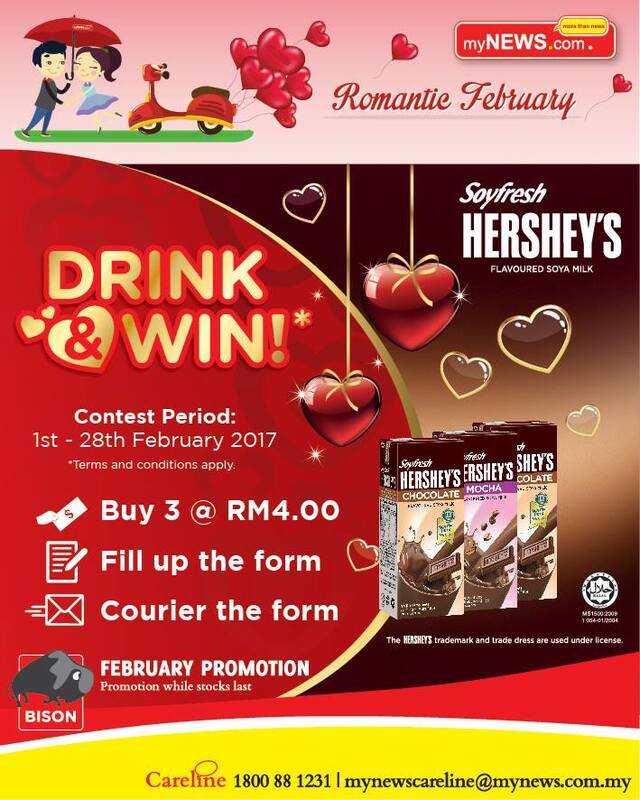 By participating in this contest, participants agree and allow Tesco to send them WhatsApp messages for communication (receive code). Winners are selected based on purchase order number. Every transaction executed successfully is assigned a unique transaction ID which is randomly generated (your purchase order number). 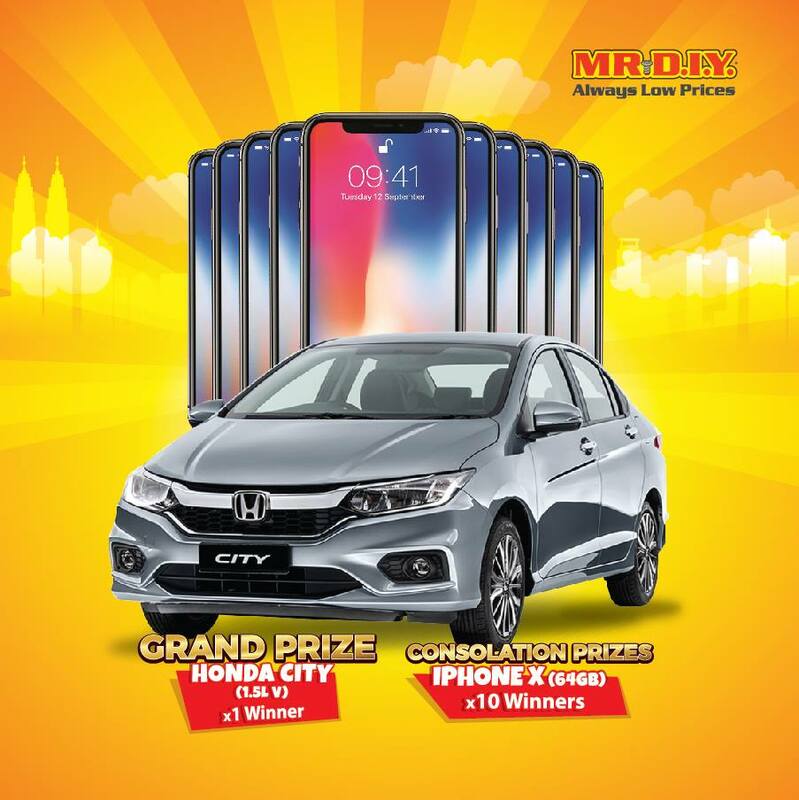 Monthly Grand Prize Winners winners are picked from the 3888th, 6888th and 8888th purchase orders respectively at every end of the month. Winners will be announced on the last day of the month. All decisions made by the judge panel of MR.D.I.Y. are final and binding in all matters relating to this contest. In the event of a dispute regarding the identity of the person who qualified as the contest entrant, the entry will be deemed to have been submitted by the person whose name appears on the mailing address of the purchase order or invoice issued by MR.D.I.Y. Daily Prize Winners winners are picked from the 88th, 188th and 288th and 388th purchase orders respectively at every 11.59pm daily. All decisions made by the judge panel of MR.D.I.Y. are final and binding in all matters relating to this contest. In the event of a dispute regarding the identity of the person who qualified as the contest entrant the entry will be deemed to have been submitted by the person whose name appears on the mailing address of the purchase order or invoice issued by MR.D.I.Y. 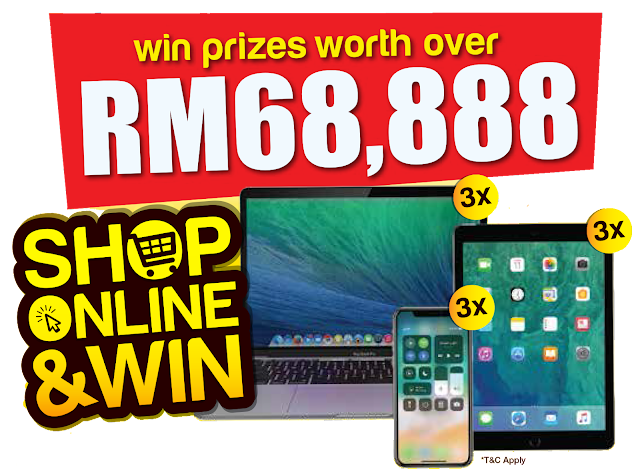 This contest is open to all Malaysians and residents of Malaysia only. MR.D.I.Y. will contact the selected winners via email or phone. If a selected winner cannot be contacted after three (3) business days, the selected entrant will be disqualified and another eligible contest entry will be drawn. 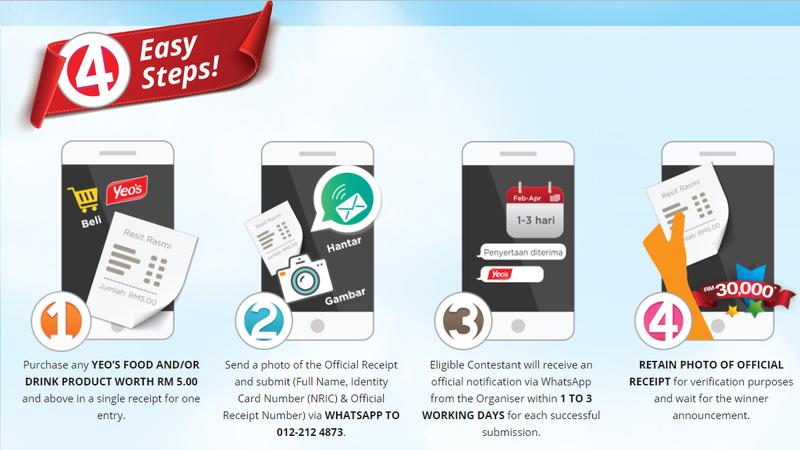 This process may be repeated until an eligible contest entrant has been successfully contacted and declared the winner. MR.D.I.Y. reserves the right to substitute a prize of equivalent or greater value if a prize cannot be awarded as described for any reason. Prizes will only be awarded to verified winners. Shall there be any damage, defect, error, or any fault found in the prize. MR.D.I.Y. holds the right to be held not responsible shall the damage, error or fault found is not caused by MR.D.I.Y. Itself. By entering this contest, entrants are deemed to have agreed to abide and be bounded by the contest rules, terms and conditions. 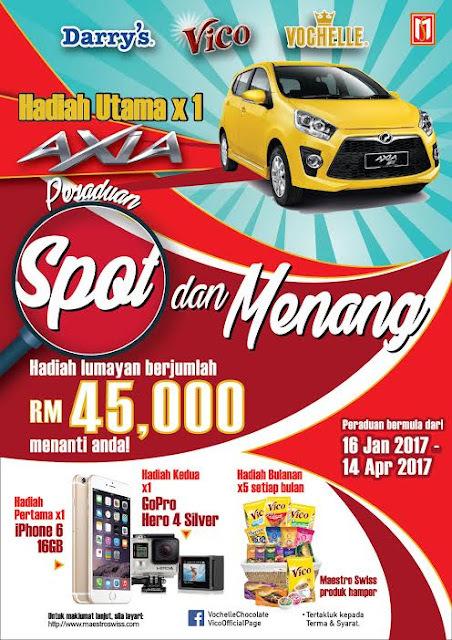 Kini anda berpeluang memenangi sebuah Perodua Axia dengan menyertai Peraduan Spot & Win 2017 anjuran Maestro Swiss. 1: Beli produk jenama Vico, Vochelle ataupun Darry’s bernilai RM20.00 atau ke atas dalam satu resit rasmi. 2: Cari SEMUA jenama Vico, Vochelle dan Darry’s yang tarpapar dalam gambar yang disediakan. Borang penyertaan boleh dimuat turun daripada laman web Maestro Swiss. Klik DI SINI untuk ke link borang peraduan. Setiap peserta boleh menghantar lebih daripada satu borang penyertaan tetapi setiap penyertaan perlu disertakan dengan resit pembelian produk dari Maestro Swiss (Vico, Vochelle dan Darry’s) bernilai sekurang-kurangnya RM20 dan ke atas di dalam satu borang. Peraduan ini juga terbuka kepada pembelian secara online melalui Lazada dan 11 Street, resit hendaklah disertakan dengan borang penyertaan. Spot dan bulatkan semua jenama yang tersembunyi dalam gambar yang disediakan dalam borang penyertaan. Satu resit pembelian hanya boleh digunakan untuk satu penyertaan sahaja. Resit pembelian daripada jualan gudang atau expo Maestro Swiss tidak akan dibenarkan untuk menyertai Peraduan Spot & Menang. Pemenang akan dipilih berdasarkan jumlah penyertaan yang sah dalam Tempoh Peraduan dibahagikan dengan bilangan 20. Jika berlaku seri, maka pemenang Hadiah Utama, Hadiah Pertama dan Hadiah Kedua akan dipilih berdasarkan menjawab 3 soalan dengan jawapan yang betul mengenai produk Maestro Swiss melalui panggilan telefon. 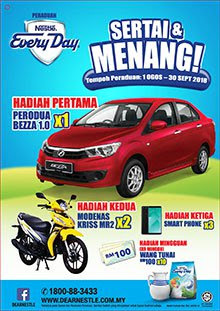 Bagi pemenang Hadiah Bulanan iaitu Produk Hamper Maestro Swiss bernilai RM200 x 15 unit, peserta akan ditentukan dengan mempunyai jumlah penyertaan yang sah dalam tempoh sepanjang sebulan dibahagikan dengan bilangan 20. Hanya penyertaan dengan bulatan betul nama-nama jenama, resit pembelian dan lengkap butiran akan dipertimbangkan. Untuk butiran lebih lanjut tentang terma & syarat, boleh lihat pada borang peraduan. Klik DI SINI untuk muat turun borang peraduan. 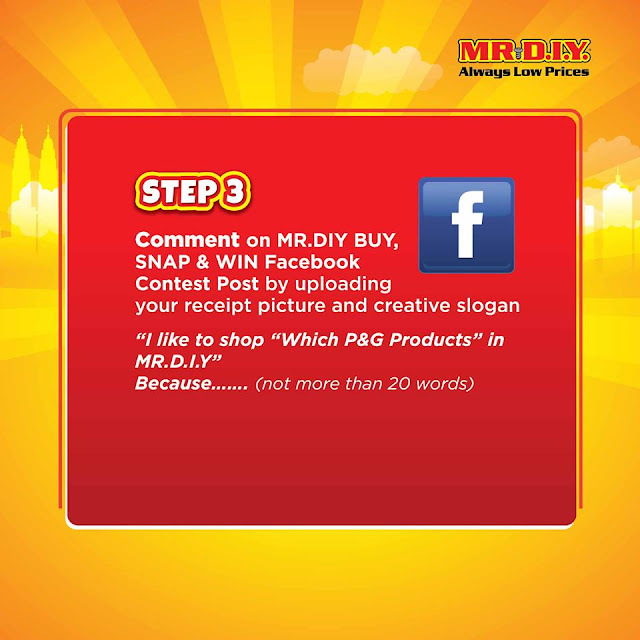 You can read the complete terms & conditions in the contest form.Contest form can be obtained from myNEWS.com outlet.